Beatles drummer Ringo Starr has marked his 75th birthday by celebrating peace and love with fans and famous friends in Hollywood. Ringo was joined by his actress wife Barbara Bach, film director David Lynch, Eagles guitarist Joe Walsh and former Guns N’ Roses drummer Matt Sorum, as well as scores of other musicians, for a street party in front of the Capitol Records building in Los Angeles. 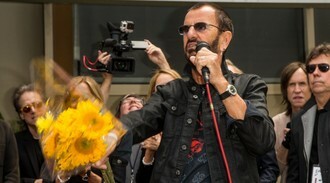 The “peace and love salute” is an annual tradition for Ringo, who has been inviting members of the public to celebrate with him wherever he is in the world on his birthday since 2005 and spread positive messages on social media. Ringo delighted fans by throwing bracelets bearing the words “peace and love” into the crowd and handing out biscuits iced with a peace sign. Later he blew out candles lit by David Lynch on a huge birthday cake also bearing a peace sign, while Joe Walsh led the crowd in singing Happy Birthday.